Wearing the Muslim veil in America may cause awkward moments, but this hijabi finds more positive than negative in her choice. I knew I was in trouble the moment I sat down. I’d just taken a seat next to an elderly Asian woman on the D-line train, on my way to a college class last year. She immediately stiffened. I began reading a book. She started twitching and looking around the train. We passed the first stop. She took out her pocket Bible, reading rapidly aloud as she rocked back and forth, clearly agitated. I felt awful, but I didn’t know how to calm her. Before we reached the next stop, she gathered her bags, hurried down the aisle, and quickly took a seat next to someone else. Being Canadian and a hijabi, I too have gone through many of the same situations Husna has experienced. Never has there been an instance where I considered removing my hijab. It is who I am and I'm not willing to give that up. This is a beautiful article, mash'Allah. It has helped to keep me strong. Thank you. wow! 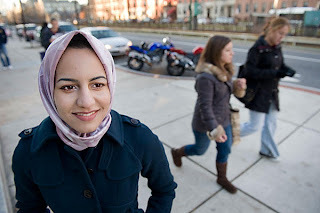 KUDOS to her, i live in america and it is still pretty hard for me to start wearing hijab in high school. this article brought tears to my eyes. Mash'Allah! What a wonderful essay. I'm very glad to have read it.